The Walking Dead takes place directly after a zombie apocalypse, following a group of survivors in their efforts to stay alive, and navigate this new world. Given the sheer number of issues in The Walking Dead series, I’m not going to necessarily focus on individual story arcs. It’s worth acknowledging that some are definitely stronger than others, though. I also came to the comics (which I ate through in a three-day period, like an insane person) well after the TV series, which undeniably had an impact on how I approached them. And while the comics largely came away on the winning side of that comparison, that this wasn’t always the case will have an impact on what follows. The thing that really struck me about The Walking Dead comics is that Robert Kirkman is not shy about exploring the impact that the zombie apocalypse has had on his characters. As much as they struggle to return to some semblance of their former lives, it’s clear that they’re broken. These are people that have been traumatised, and for all the effort that they put into trying to return to what they still think of as ‘normality,’ it’s also clear that they as individuals are most likely beyond repair. And this makes for a really interesting character study. Having an overarching plot that engages with these nuanced issues does have its problems, though. It means that when things happen that aren’t as realistic, or when characters act in ways that don’t really make sense, it’s even more obvious than it would be otherwise. Thus there are moments that are a little jarring, because they take you out of a story that is otherwise pretty good at working within the parameters that it’s established. Having seen the show first, it was also occasionally weird seeing how much some of the characters diverged from their comic counterparts. Carol? Much better in the show. Andrea? Absolutely ruined by the TV show. To the point where, however much I disliked TV-Andrea before reading the comics, that dislike was increased a thousand-fold after realising how badly they handled the material given to them with comic-Andrea. Overall, I think that the artwork gets the job done. Really, because this series is more about the characters than the art (which is good), the art doesn’t really need to do much more than that. However, I’ve read some criticisms about how the characters have a tendency to all start looking alike and, unfortunately, this is true. I just opened issue #128 and thought I was looking at two Ricks. It was actually none. This is a problem. 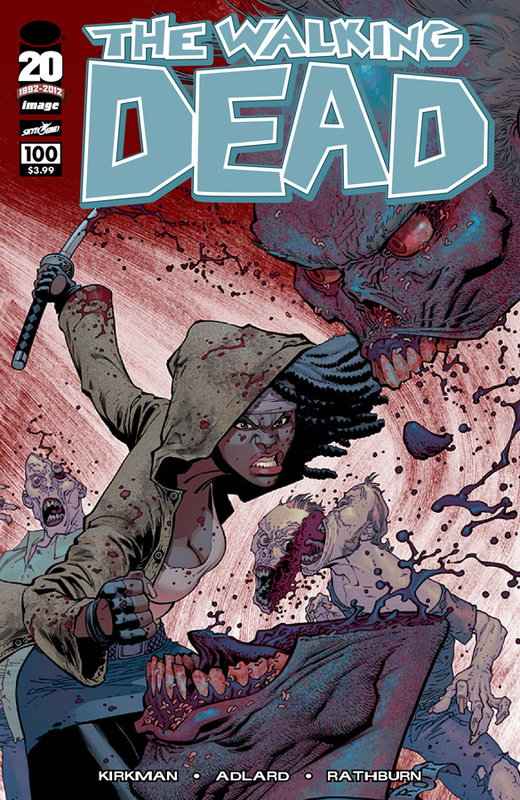 At the end of the day, I’m definitely looking forward to new issues of The Walking Dead comic with greater enthusiasm than I’m awaiting the next season of the TV show (which I actually stopped watching mid-way through season 3, now that I think about it). Not even just because it’s much further along in telling these characters’ story – but because it’s just better at doing it. There’s an almost rabid sense of hope in the comics that the TV show lacks, and for a story about the end of the world as we know it, I feel like this is exactly what’s needed.